WWE have done the seemingly impossible and made Smackdown actually feel important again! With three top matches that had been well promoted and featured some of WWE’s top stars, Smackdown was great watch this week. This is definitely the route WWE should be going with the show and I’d like more of the same in the coming weeks and months. The show kicked off this week with World Heavyweight Champion Alberto Del Rio heading to the ring to announce his decision on who he would pick to face him for the World Heavyweight Championship at SummerSlam. It was pretty obvious that Del Rio would be choosing someone not quite up to the standard of a real number one contender, as he eventually went on to choose Ricardo Rodriguez, in a decent heel promo. He was interrupted by Smackdown General Manager Vickie Guerrero, who wasn’t too happy with Del Rio making a mockery of her SummerSlam match. She announced that instead of Del Rio facing Rodriguez or his second choice of the Brooklyn Brawler, Del Rio would face the winner of a triple threat later on in the evening. The triple threat would include Rob Van Dam, Christian and WWE Championship Money in the Bank winner Randy Orton. It was pretty much the guys I had been talking about in regards to Del Rio’s challenger. The only thing that let this segment down was Guerrero attempting to play a face, against Del Rio’s heel, which didn’t quite work, because Guerrero is able to get a lot more heat than Del Rio. In build up to the match there were a few backstage segments, firstly with Alberto Del Rio visiting Vickie Guerrero in her office, to complain about her decision. Guerrero accused Del Rio of being scared of competition, before Brad Maddox came in, agreeing with Guerrero and reminding Del Rio who was in charge on Monday Night’s. I’m not quite sure what the segment was trying to achieve, other than to make the World Heavyweight Champion look a bit rubbish. Later on in the night, Renee Young interview with Rob Van Dam, was interrupted by Christian and Randy Orton, as they each put forward their case to why they would win the triple threat later on in the evening. Whilst Van Dam’s promo was puzzling, Christian and Orton both delivered strong attempts, with Orton really impressing me, bringing an edge to his character that hasn’t been seen for sometime. 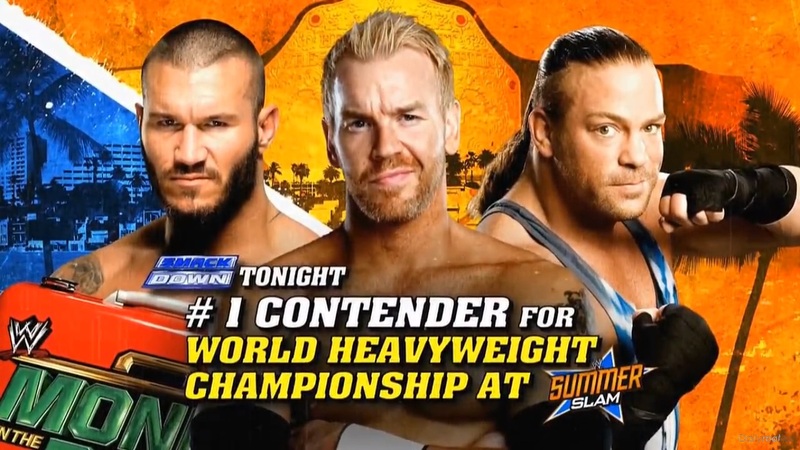 The match itself was a pretty exciting triple threat and worked well as television main event. It didn’t really use the triple threat concept to it’s advantage for most of the match, as we saw different combinations of the three men involved, which was helped by each man having history with the other two. As with a lot of WWE triple threats, there were a number of good spots throughout, which were strung together well and the match had a really nice flow to it, a highlight for me saw Van Dam somersault over the top rope onto Christian and Orton on the outside. For me the best work of the match came between Orton and Van Dam, who had an excellent sequence of reversals which ended with Orton reversing Rolling Thunder in a spinning powerslam, which was visually impressive. The end sequence saw Orton building up for an RKO on Christian, but with Van Dam attempting to take advantage, Mr Friday Night ended up getting an RKO of his own. However, with Orton going for another RKO on Christian, Captain Charisma reversed into a backslide to pick up a victory and the chance to face Alberto Del Rio for the World Heavyweight Championship at SummerSlam. I really enjoyed the finish here as it looked like anyone could win up until the final moments, keeping me guessing who would get the title shot. With Orton and Van Dam shaking Christian’s hand after the match, Alberto Del Rio who was at ringside, took advantage of Josh Matthew’s interviewing his new number one contender, knocking Christian over with a punch to the back of the head and finishing him off with a Superkick. With SummerSlam having a number of well-built up rivalries and feud going into the show, Christian and Del Rio have a lot of ground to make up. After Fandango interrupted CM Punk last week, leading to the Ball Room Dancer receiving a GTS, it was nice to see WWE use some continuity, and bring us a match between the two this week on Smackdown. It was also nice to take a bit of a break from CM Punk’s rivalry with Paul Heyman and Brock Lesnar. Whilst the story has been fantastically well crated and a pleasure to watch throughout, it is important that WWE don’t over expose the characters and ideas of the feud, which has been going on for almost two months, and has a further two weeks until Punk and Lesnar finally clash at SummerSlam. I said a few weeks ago, that CM Punk needed to stop the talking and pick up a strong convincing victory, to help him look like the arse kicker he needs to be to look convincing against Lesnar. This match certainly brought that as CM Punk looked very impressive throughout. With Fandango, who was accompanied by Summer Rae, just getting in enough offence to make the match seem competitive, it was clear that this was the CM Punk show. Fandango played his role well, using enough classic heel tactics to get the fans even further behind Punk, and keeping him grounded with a headlock, allowing Punk to build to a come back. Punk eventually picked up the win, with Punk hitting a Superplex and immediately locking in an Anaconda Vise to get the submission victory. It was a well-paced ending, and an original one, as Punk showed he meant business heading into SummerSlam. It wasn’t a particularly long match, but it didn’t need to be, it did its job of making Punk look impressive, whilst also allowing Fandango another opportunity to work with another of WWE’s top names and not look completely out of place. Punk could do with one more match like this to really help to push the idea home that he is in a different mindset to what we’re used to and make him look like a legitimately threat to Brock Lesnar. So, Punk and Lesnar is only two weeks away now, and it will be interesting to see if WWE can keep the momentum of the story continuing into SummerSlam, personally I think they will, as Punk and Heyman seem to be heavily involved in the crafting of the storyline and I’m pretty sure two of modern wrestling’s greatest minds will have come up with how the next couple of weeks will run months ago. Fandango on the other hand looks like he is going to miss out on the SummerSlam card this year, however it would seem that WWE has a long term plan for him as they keep putting up against top talents, even protecting him on Raw against Rob Van Dam. Personally, I think the gimmick can only go so far, but time will tell. Elsewhere this week Diva’s Champion AJ Lee defended her championship against long time rival Kaitlyn. Before the match, Renee Young interviewed Kaitlyn and friend Layla about their friendship, with Layla spouting some awkward speech about Kaitlyn being the most dedicated Diva she had ever seen. It kind of sign posted what was going to happen later on in the evening, mainly because we hadn’t seen Layla for a few weeks, and therefore her randomly turning up this week made instantly think that something was going to go down. The action in the match was good, with Kaitlyn’s aggression having an opportunity to shine through as she really took it AJ Lee. It wasn’t long before the action spilled to the outside with Kaitlyn throwing AJ into the barricade. It was here that Layla made her presence felt, when stepping in front of AJ Lee with Kaitlyn about to hit a spear. With Kaitlyn distracted AJ took advantage, throwing Kaitlyn into the ring and locking in the Black Widow to retain her title via submission. The Layla turn was fairly obvious, but I’m glad she’s back as a heel, as she skipped away with AJ, as her face run has been pretty forgettable. This match could have done with another five minutes to really build to the ending moment, but the girls did well with the time they were given. Cody Rhodes’ face run also continued this week on Smackdown, as he faced Jack Swagger. After knocking the microphone away from Zeb Colter, Cody really went after Swagger looking fairly impressive in the process. Cody picked up a quick victory after a reversing a Gut Wrench Power bomb attempt into a sunset flip variation for the pinfall. It was decent television match, but obviously these two could have done a lot better given some more time to develop. Time is something that Cody needs at the moment to develop his face character, but with SummerSlam just around the corner he might not have time to do so. Talking of SummerSlam, Cody’s SummerSlam opponent Damien Sandow attacked him during a post-match interview with Renee Young, it was a vicious side of Sandow that we rarely see, and I have to say I am very much looking forward to their SummerSlam bout. Big E Langston was also in action this week, as he ploughed throw Sin Cara. Big E looked impressive as he methodically tore apart Sin Cara with a number of impressive power moves. Big E picked up a quick victory, after catching Sin Cara from a springboard crossbody attempt and hitting the Big Ending for the pinfall. After watching Langston in NXT for so long, I know we’ve only just scraped the surface of what Big E can do for WWE. Personally, I think that Big E is a much better face than he is a heel, as he seems like a naturally good natured and humorous person, whilst his heel portrayl has been limited to almost a generic big guy at times. I’d also like to see him given more time in the ring sometime soon, hopefully his match at SummerSlam will provide that opportunity, whether it’s one on one with Dolph Ziggler, or teaming with AJ Lee to take on Ziggler and Kaitlyn. What did I learn from this week's Smackdown? 1. Christian and Del Rio have a lot of ground to make up to make their rivalry SummerSlam ready. 2. Even when something is as good as Punk/Heyman/Lesnar, it's still good to have a break sometimes. 3. Alex Riley is work in progress on commentary, but looks promising.